Our portable games are silk-screened on fabric using a durable ink, and are completely machine-washable. They include pieces, rules, a brief history of the game, and are packaged in a draw-string canvas pouch. Played by princes & peasants for 3,000 years, Morris is simple enough for children, yet the strategies can interest adults. The object is to form "mills"(3-in-a-row). When a you make a mill, you can steal an opponent's piece. You win by reducing the opponent to just 2 men. 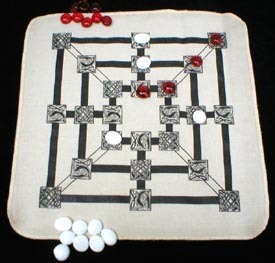 Early versions were played with 9 pieces, but in the 14th century diagonal lines were added to the board and was played with 12 men.